Last month we mentioned that Dungeness Valley Creamery is selling their raw Jersey milk, and that it is wonderful. Apparently, the milk is selling well. Country Aire was sold out, but Good To Go, a new organic food shop up on Lauridsen Boulevard which we should discuss in greater detail, had a quart. We drank most of it, but we saved enough to make our favorite pork chop recipe from Marcella Hazan's The Classic Italian Cook Book. After all, we had just gotten our half Berkshire pig from Nash Huber so it was time to pig out. Heat the butter and oil in a frying pan over medium high heat. 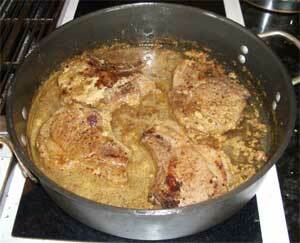 Brown and cook both sides of all the pork chops, turning them now and then so they get caramelized nicely. Lower the heat if the butter starts to brown. Add salt and pepper. Pour in the milk gently, sloshing it around. Lower the heat to a simmer and cook with the lid closed for about 45 minutes. Turn the chops now and then so that they simmer in the liquid. The chops will get incredibly tender, and the flavors will be incredibly rich. Serve with the cooking liquid, and try not to fight over the milk curds that will form. On our way back from Port Townsend we noticed a sign for shrimp not far from the casino in Blyn. We were soon following the twisty roads to The Hull Family Shrimp compound at 152 Thompson Road. They had shrimp, but only the smaller ones, and only cooked. They were most apologetic, but the big shrimp they said would not be available until June 15th. The smaller shrimp, sold cooked and with their heads on were fresh and delicious. We bought a couple of pounds at an excellent price and the very next morning woke up to a shrimp and garlic revuelto with lots of Tabasco sauce. What a morning! We can hardly wait for big shrimp season. We'll give them a call at 360 683 6219, and make a special trip out to Blyn. We haven't been to Port Townsend in a while, so when we went to see Duma, a charming movie at the Rose Theatre about a boy and his cheetah, we tried a new restaurant, Fins. 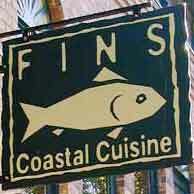 Well, we still love the Fountain Cafe, but Fins is a serious contender. Now, if we can ever get back to Port Townsend for dinner. There seem to be an AWFUL lot of triliums on the Lake Angeles Trail this year. We've always seen triliums on our way up towards the lake, but this year they are all over the place, sometimes in clusters of six or eight, and each time we climb, there seem to be more of them. Being Kalebergs, we have several theories about this. The most obvious explanation is that there was an AWFUL lot of deadfall over the winter. There were serious windstorms and the trail seems to be much more open. The various streams, usually only heard, are now often visible, and a lot of the trees seem to be horizontal rather than vertical. This means that there is more sunlight, and while triliums are not sun lovers, the additional sun might encourage them. Our other explanation is that there was more snow cover this winter, and that means that there is more water in the soil. For the first time in several years we seem to have a proper snowpack in the high country, and while this trail has never been particularly dry, it is possibly moister this year. 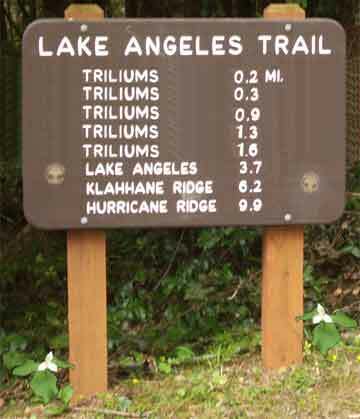 No, we have still not made it up to the lake, but we have enjoyed the lower portions of the trail and all those triliums. We rarely expect all that much from a can of tuna. Canned tuna is one of those products that can be good, or better, depending on how you use it, but we recently came across a can of Ventresca Bluefin tuna from an outfit called Gustiamo, and we were amazed. The flavor was rich and soft, almost like a perfect tuna confit, packed in olive oil. The texture was soft and silky. We made up a dish of the tuna with white beans, marjoram, nicoise olives, sweet onion and tomato. We ate it straight from the can. We had it on bread. We like Bumble Bee tuna well enough, but this is just in another class. The price is too. Yes, it is expensive, but we have never eaten tuna this good before.